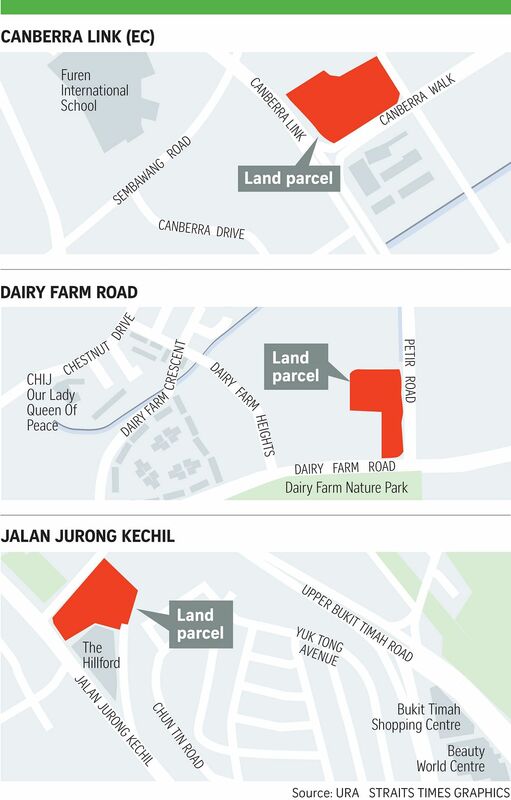 But there were just five bids for a plot on Dairy Farm Road, and only three offers came in for a Jalan Jurong Kechil site, sharply down from the record 24 bids submitted last year for a nearby Toh Tuck Road plot that now houses Daintree Residence. For the Dairy Farm Road site, it was United Engineers’ UED Residential that submitted the top bid of $368.8 million, or $830 per sq ft (psf) per gross floor area (GFA). There were five offers in all for the 211,486 sq ft site, which is meant for residential development with commercial uses on the first storey. The 99-year leasehold site, with a maximum permissible GFA of 444,129 sq ft, was launched for sale on May 31. The second-highest bid of $364.9 million came from MCC Group’s MCC Land (Singapore) and Greatview Group and Yu Zhisong’s Greatview Investment, and the lowest bid was from Wee Hur Development at $228.8 million or $515 psf. The others in the bidding ring included a tie-up between COHL Singapore and CSC Land Group (Singapore) ($357 million), and Chip Eng Seng’s CEL Development ($333.3 million). CSC Land Group (Singapore) is a unit of China Construction (South Pacific) Development, while COHL Singapore belongs to Jiak Kim Propco Sarl, which has a Luxembourg address. CBRE’s Mr Desmond Sim noted that the winning margin between the top bidder and the second-highest bidder was a mere 1.1 per cent. In contrast, the winning margin for a site along Jalan Jurong Kechil was 31.3 per cent. The top bid was by a tie-up between COHL Singapore and CSC Land Group (Singapore) at $215 million or $1,002 psf per GFA. There were two other bids: Hao Yuan Investment’s at $163.8 million, and Sim Lian Land’s at $130 million. This 99-year site, which was launched for sale under the Government Land Sales programme on June 28, spans 153,223 sq ft with a maximum GFA of 214,513 sq ft.
Mr Sim said “the lower price quantum for this site, as well as a yield of only 280 units, has emboldened the winning bidder to put a more generous bid to secure this land bank”. CBRE noted that there were fewer than 20 EC units unsold in the pipeline as at the end of the second quarter, which probably explained why Canberra Link drew the most interest of the three sites. Hoi Hup Realty and Sunway Developments submitted the highest bid for the tender at $271 million, or $558.22 psf per GFA. The second-highest bidder was Greatview Investment and MCC Land with a bid of $258.9 million or $533.28 psf. The lowest bidder was JBE Development with a bid of $201.8 million or $415.72 psf. The 99-year land parcel was launched for tender on June 28, for a 194,187 sq ft site that will yield an estimated 450 units. It has a maximum gross floor area of 485,468 sq ft with a gross plot ratio of 2.5.